Sharome, whose father Oliver Burton is a retired national basketball team captain, currently works as a News & Sports Reporter at DBS Radio where he regularly presents the station's news and/or sports packages. Sharome has also commentated at a couple of basketball finals which were being carried live by DBS Radio. Beyond the 3-Point line, Sharome plays as a starting Shooting Guard with 7Six7 Sports Club Young Ballerz in the 2nd level men's division of the national league. Sharome was featured along with his Dad in Segment B of Basketball in the Family which was published in The Sun on 11th December 2017. Nigel began his media career as a Camera Operator with SAT Telecoms and, after some time, he began video-editing. From around 2011 Nigel took up a position as Camera Operator with Government Information Service (GIS) where he is also the main video-editor. One afternoon I met Nigel, still dressed in his "working clothes", on his way to change off. He was going "for a sweat" on the Bath Road Basketball Court where he and his colleagues would have been using a generator to light up the court in the post-Maria era. Nigel played competitive basketball in four leagues to date. He debuted in the Sports Division Schools League, playing with St. Mary's Academy Under-19 which was coached by "Sir" Cuthbert Elwin (deceased). He played with SMA for two years, one of which was a championship year for his team. Next, he played for one year with Clifton Dupigny Community College, which also competed in the Schools League. Nigel's next "big basketball move" occurred when he joined and played with Sharks in the Premier Division of the national league. He chuckled when he disclosed that several other Premier Division teams wanted him to join them, but he chose Sharks, which hailed from Scott's Head and Soufriere. Nigel also played in the Goodwill Off-Season Leagues, and later with Fond Canie Rebels in the Trafalgar Basketball League. Currently, he simply plays recreationally. 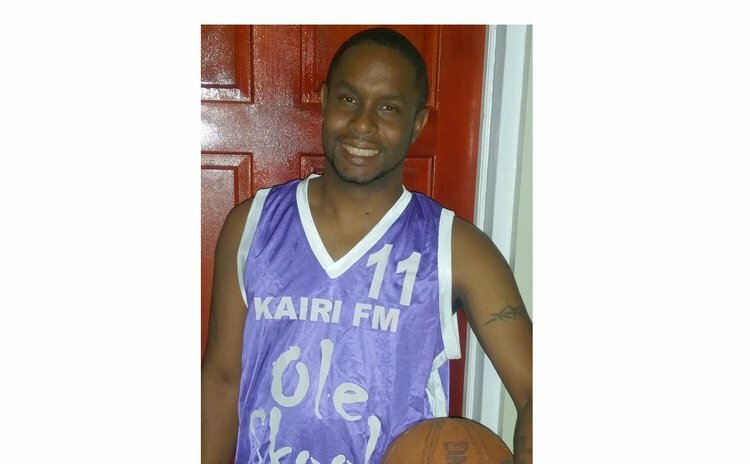 Garvin, the son of Peter Richards - former prominent DBS Radio personality who is now affiliated to a major regional media house – is the current Sports Editor at DBS Radio. He has also served as a Sports Reporter and Sportscaster, and hosts DBS Radio's weekly "Off The Field" programme which focuses on matters of sports, including basketball. He also serves as a presenter of DBS' regular News & Sports package, and of their annual News In Review and Sports in Review packages. Garvin has captured the prestigious Sports Reporter of the Year Award at the annual national sports awards presentations on five (5) occasions, and was recently elected as the first President of the Dominica Media & Communications Association. Even with such a hectic media schedule, Garvin, who is popularly known as "Rice Man", finds time to play national league basketball with Ole Skool – one of the top teams in the league's 2nd level division. But before entering the national league Rice Man had played with St. Mary's Academy, followed by Clifton Dupigny Community College, in the Sports Division "Schools League". Furthermore, while attending school in Barbados he played with Lodge School in the schools' league in the "Land of Flying Fish". Back on the local scene, Garvin has also played in the Mahaut Basketball League with Belfast Bucks, and in the 2014-2015 Roseau Valley League with Laudat. Garvin occasionally officiates in national basketball league matches. Johnson has been a media personality for almost three decades, first locally, and now regionally. On the local scene, Johnson wore several caps at DBS Radio in the 1980s into the 1990s, working as announcer, reporter, news editor and programme director. Subsequently, he went on to hold some key positions with regional media houses, including the Caribbean News Agency (CANA) and the Caribbean Media Corporation. Johnson is also a journalist, writes regularly for THE SUN newspaper, and edits for other regional and international media. Additionally, he has been training young journalists and is also a media and communications trainer, working with regional and international leaders and senior executives. Turning our attention to the trajectory of the ball, Johnson, who originally hailed from Pichelin but grew up between Pichelin and Grand Bay, played basketball in the national league with Ogan Stars of Grand Bay. He was also a member of the DBS Dream Team. Johnson also officiated in the national league and served as Public Relations Officer on the Executive of the Dominica Amateur Basketball Association in the late 1980s.